Pullmantur, Spain's largest cruise line, offers high-value, high-quality cruising with a spicy Spanish-Mediterranean flair. And while it markets mainly in Spain, the company welcomes international passengers -- the onboard product is largely bilingual with printed materials and the like in English. It's an intriguing option for those looking for a change from the usual English-speaking mass-market cruise lines. Spain-based, owned by Royal Caribbean Cruises Ltd.
Spanish influence means early seating dinner is at 8 p.m. Yet this five-ship operation was virtually unknown outside its native country until late 2006 when Royal Caribbean made the stunning announcement that it had purchased the company. Since then, many more foreigners have taken notice as they've found that favorite ships -- like Celebrity's Zenith, and Royal Caribbean's Empress of the Seas and Sovereign of the Seas -- have been transferred to Pullmantur from RCI. 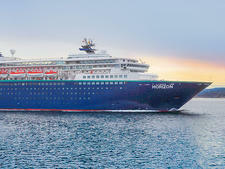 Pullmantur's hold on the Spanish cruise market began when the Madrid travel agency and tour operator of the same name, founded in 1971, chartered Premier Cruises' Seawind Crown in the late 1990's. 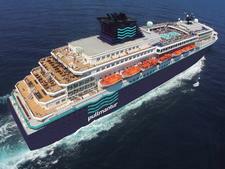 The company experienced moderate success, and when Premier went bankrupt in 2000, Pullmantur bought that line's largest and most modern ship, Oceanic, and founded its own cruise line. Pullmantur began operating cruises from Barcelona in 2001. At the time, few could have imagined the impact the new company would have on cruising in Spain and the cruise industry as a whole. In 2001, Spain was just beginning to discover cruising, mostly on foreign cruise ships, with many leaving from foreign ports. The formation of Pullmantur Cruises, with Oceanic's weekly departures from Barcelona, jolted Spanish cruising into overdrive. With low, all-inclusive fares, smart marketing and a quality product, Pullmantur had an effect in Spain that can be compared to that of Carnival in the United States: Suddenly, a company was making cruising affordable and popular to the masses. Expansion came quickly. In 2002 the company bought the one-time Pacific Princess, the famed "Love Boat", from Princess Cruises. 2003 brought yet another new ship: Holiday Dream, formerly Star Cruises' SuperStar Aries and originally Hapag-Lloyd's uber-luxury Europa. (It was replaced in 1999 with the current ship of that name.) After buying three ships of its own, and still desperate for more capacity, Pullmantur chartered the R Five in 2004 from the creditors of the bankrupt Renaissance Cruises, marketing the ship as Blue Dream. In 2005, R Six, marketed as Blue Star, joined the fleet. Later that year, R Five left Pullmantur to become Oceania Cruises' Nautica, and Pullmantur bought R Six outright and named her Blue Dream (confusingly, the marketing name previously assigned to R Five). Meanwhile, the charterer of R Seven, Delphin Seereisen, had gone bankrupt, so in 2006 that ship too was bought by Pullmantur and renamed Blue Moon. That same year, in its final acquisition before being taken over, Pullmantur bought P&O Cruises Australia's Pacific Sky, formerly Princess' Sky Princess and before that Sitmar's Fairsky. The ship was renamed Sky Wonder. Then, a few months later, came the announcement that Pullmantur -- including its tour operator and airline sister companies -- had been scooped up by Royal Caribbean, the world's second largest cruise line. It now had the backing of a much larger, wealthier company to help continue its expansion. The deal gave Royal Caribbean a strong presence in the European market. Over the past five-plus years, Royal Caribbean has left its mark on Pullmantur's fleet. After innumerable ship swaps, 2011's fleet consists of Empress (formerly RCI's Empress of the Seas), Ocean Dream, Zenith (Celebrity Zenith), Sovereign (Sovereign of the Seas) and Pacific Dream. Pullmantur's Zenith joined the line in 2008, but was built for Celebrity Cruises in 1992. The ship carries 1,440 passengers and offers larger-than-average cabins. The Pullmantur ships offer all the trappings of a traditional cruise -- with a Spanish accent. This means two-seating dining: early seating dinner is at 8 p.m. and late seating at 10:15 p.m. (one example of the Spanish preference for evening meals), production shows, a spa and gym, casino, shops, youth programs and pretty much everything else you'd expect of a typical mass-market cruise experience. While Pullmantur is certainly not a luxury cruise line, most passengers seem happy with the product and appreciate the good value it represents. Like most mass-market lines, Pullmantur attracts a wide cross-section of passengers, though naturally on these cruises they're mainly Spanish (or Brazilian during the winter months); nevertheless you'll find passengers of all ages and types. There may also be some non-Spanish-speaking passengers from Northern Europe or Canada, where some tour operators market Pullmantur's cruises. Zenith, which was built for Celebrity Cruises in 1992, joined Pullmantur in 2007. At 47,255 tons and 1,440 passengers, it's the largest ship yet to join the Pullmantur fleet, and like many of its fleetmates, offers larger-than-average cabins. The decor is more modern than most of the company's other ships; it went through a major refurbishment before entering service with Pullmantur. On the other hand, the ship isn't quite as spacious as Holiday Dream or Pacific Sky. A trio of ships joined the fleet in 2008, replacing older hardware whose time had come. The 48,563-ton, 1,602-passenger Empress was built in 1990 as Nordic Empress, which later became Royal Caribbean's Empress of the Seas. Cabins are smaller than on most other Pullmantur ships, but there are more balconies, and the ship brings the company its first atrium and first two-deck dining room. Sovereign, formerly Royal Caribbean's 1988-built Sovereign of the Seas, was transferred to Pullmantur in November 2008. The 73,192-ton, 2,276-passenger ship is widely acknowledged as the world's first mega-ship. In 2009, Pullmantur introduced the 46,811-ton, 1,875 passenger Pacific Dream, which most recently sailed for the U.K.-based Island Cruises as Island Star. Also joining the fleet in 2008 was Ocean Dream, which formerly sailed as P&O Cruises Australia's 33,250-ton, 1,022-passenger Pacific Star. Built in 1981 as Tropicale, the ship had a massive refit in 2001 when it moved to the Costa fleet as Costa Tropicale, and consequently has unusually modern, stylish interiors for a Pullmantur ship. Large cabins are another feature in common with many of the company's other ships, as is an abundance of open deck space.